Plue "The Canis Minor, Nicola"
Plue is a Silver Key Celestial Spirit with no actual combat abilities, stated to be usually kept as a pet for less powerful Mages, including Lucy herself as his owner. His key was sold for 20 000 Jewels. 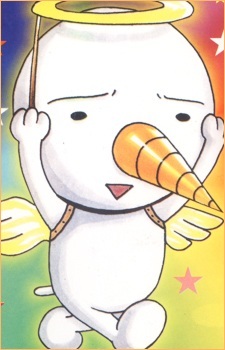 Because he is not made for combat, Plue serves as a cute companion instead. He is very obedient and ready to help Lucy whenever she needs his help. Along with that, he enjoys sweets and shares a close friendship with Happy and is often seen teasing Lucy and Loke along with him. He is also very apologetic, as he immediately apologized to his owner after harming her under the influence of Sherry's Magic.